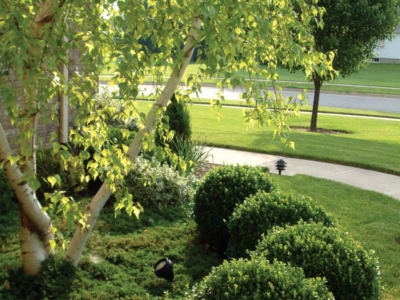 We all know that it’s necessary to fertilize your lawn, but it’s also important to fertilize your small trees, shrubs and ground cover. We offer this tree and shrub feeding service once a year in the fall. We use a unique, nutrient-balanced tree fertilizer that is low in sodium, but rich in iron, copper, sulfur, manganese and zinc; all the elements necessary for proper tree and shrub care. This feeding helps your trees and shrubs maintain strong, healthy foliage and vigorous root development. Check out our other lawn care services to provide a beautiful yard and pest free home.